As I think I mentioned before, I've been looking forward to the release of the PS3, but with the glitches and the delayed launch I figured I would leave it until later in the year - which also helps with studying due to fewer distractions! Anyway, today I got my first glimpse of the console for real when I walked past the Sony Centre and saw their display machine ... and couldn't help thinking they were playing into the hands of the XBox 360 or Wii camps or the Sony nay-sayers. 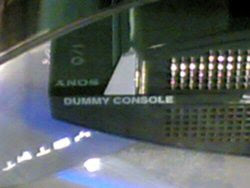 Can anyone else think of another phrase for "Dummy Console"?!? !